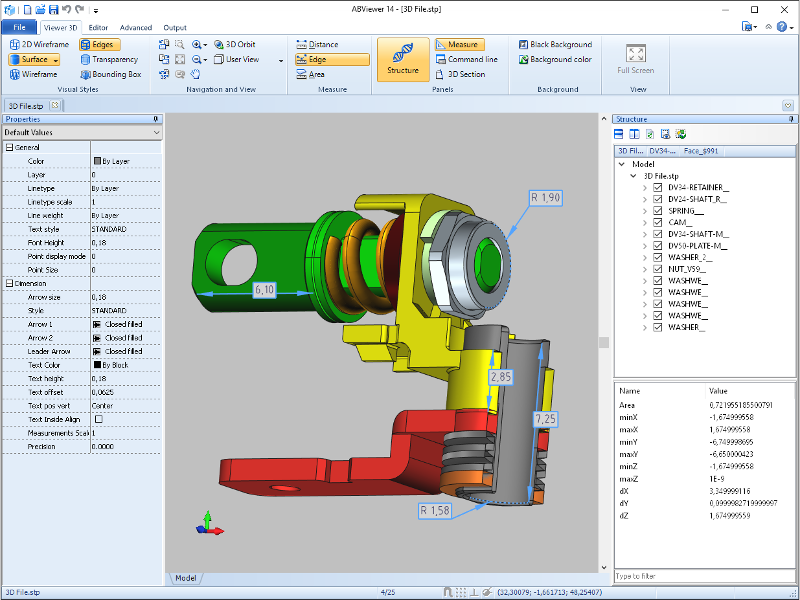 STP Viewer is a professional software to work with 3D file formats. In addition to STP/STEP, it supports more than twenty popular 3D formats, including IGS/IGES, SAT, STL, OBJ, BREP. The viewer has different visual styles and all necessary tools to interrogate 3D models. The panel Structure shows the file content and properties of the selected object: its overall dimensions, volume and center of mass. By using this panel users can control visibility of 3D models' parts and save separate parts as DWG or DXF files. With easy-to-use measuring tools users can get more detailed information about a 3D model: area, height between two parallel surfaces, distance between two points, length of an edge and radius of a circle or a circular arc. Results of measurements are displayed in the special panel and added above the 3D model. Dimension texts can be moved, hidden or deleted. The 3D model with all measurements may be printed or saved as BMP file. 3D section tool enables to create one or more fully customizable section planes. They cut a 3D model so users can peer inside it and measure its hidden elements. It is possible to convert 3D files to other formats such as STP/STEP, IGS/IGES, STL, DWG, DXF, OBJ, PDF, JPG, etc. The software gives an opportunity to work not only with 3D, but also 2D CAD formats: DWG, DXF, HPGL, SVG, CGM and others. Feature-rich software, reasonable price, perpetual license! New dynamic 3D section tool; New 3D features: Transparency, Bounding box, Anti-aliasing, Edges, Hidden lines, STEP <-> IGES converter; Enhanced user interface; Export to AutoCAD DWG 2010; Optimized reading and saving of DWG and DXF files; And many others. CDR Viewer Tool is an absolutely indispensable solution for graphic artists, designers and illustrators that combines the features of a powerful CDR file viewer and a file recovery tool based on advanced file analysis algorithms. Mimics translates CT and MRI scanner data into full 3D models, finite element meshes or rapid prototyping data (STL) within minutes and it allows you to simulate surgical procedures. Raster to Vector converter,TraceART transform any raster images into a vector format.vectorizer, which can high-speed convert raster bitmap into vector image. it supports such all kinds of image format as BMP,JPG,TGA,TIF,PCX etc. DWG Converter 2016 - Batch Convert DWG to PDF WMF BMP JPEG GIF PLT SVG CGM EPS, and also supports the conversion between DXF and DWG file versions (R2.5-R2016). STP, STEP, STP viewer, STEP viewer, 3D, 3D viewer, STP to DWG, STP to STL, STP to JPEG, STP to OBJ, STP to PDF, STP to IGS, IGS to STP, IGES to STEP, 3D section, section, cross section, convert, converter, measure, measuring, section view STP Viewer is a professional software to work with 3D files. It supports STP/STEP, IGS/IGES, STL, OBJ, SAT, BREP, DWG, DXF, etc. The software has a dynamic 3D section tool, measuring tools and allows to convert 3D files to different formats.